Advantages: Entertaining collection of firebomber cartoons, related characters and descriptive text; captions in French and English; index of aircraft types included. Jean Barbaud will be known to HyperScale visitors for his Gallery artworks and illustrations in French model magazines. Jean has now turned his talents to a new book with Alexandra Zainal entitled "Pompiers en Zings". The focus of this book is firebombers. Between its hardback covers, we are presented with colour caricatures of a wide variety of firebomber types including the CL 215, PBY Catalina, S-2T, S-2F, PZL M-18DC-4, DC-6, Fokker Freindship, AT-802, DH Beaver, Lockheed Constellation, Ford Trimotor, B-17, B-25, Avenger, PB4Y Privateer, P-61, F7F, A-26, C-97, C-119, C-123, C-130, PV2, P2V, P-3, Martin Mars, OV-10, UH-60L, H-54/S-65 Skycrane, AN-2, Mil Mi-8Be-12, Be-200, Il-76; plus some firefighting "what-ifs" including the S-3, A-10 and even a Boeing 747! The book comprises 64 pages plus covers printed on high quality art paper. Jean Barbaud's caricatures are entertaining and imaginative. The aircraft are also supported by a range of equally colourful cartoon characters. The main text is presented in French, with selected captions being in both French and English. 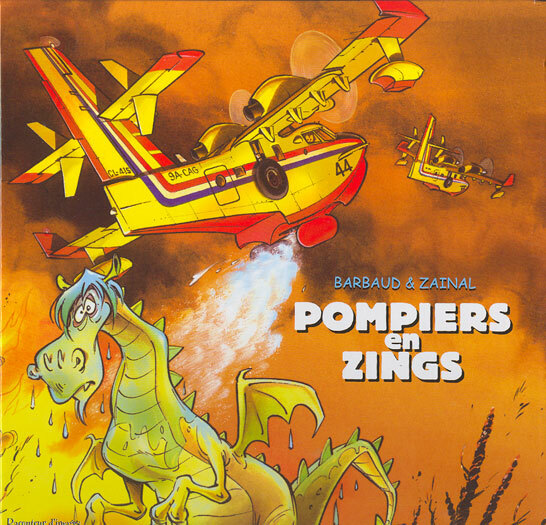 If you enjoy Jean Barbaud's artwork, or are a fan of firebombers, you will take pleasure from "Pompiers en Zings".